The Frame Extnesion reduces the wake of trailer and increase base pressure to reduce drag. 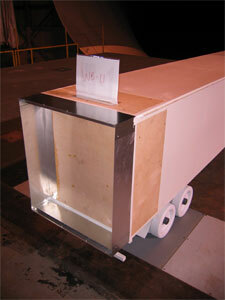 The SOLUS Frame Extension is applicable to trailers with roll-up doors. 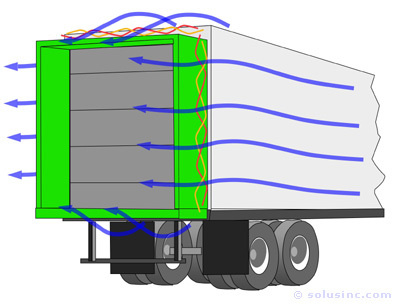 This technology has undergone extensive wind tunnel testing and will provide 4 to 5 percent fuel savings. Calculate your potential cash savings! All SOLUS fuel Savings devices have undergone extensive evaluation on the Solus/ODU Representative Heavy Truck (SO RHT) wind tunnel model in the Langley Full Scale wind tunnel. SAE Type II road tests are scheduled for Sping '06 to further document fuel savings. If you are interested in licensing this invention please contact us. Click here to download a brochure about SOLUS' new drag reduction technologies.